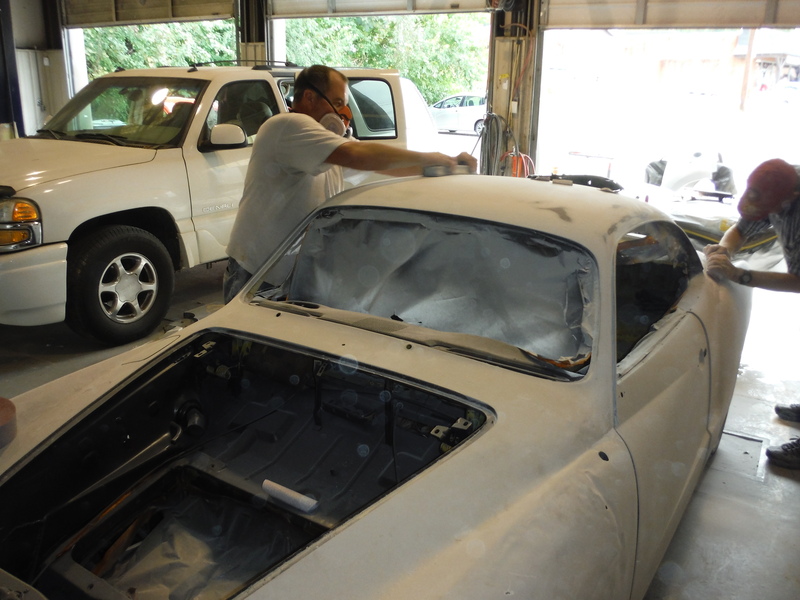 Back on the ’71 Ghia today. 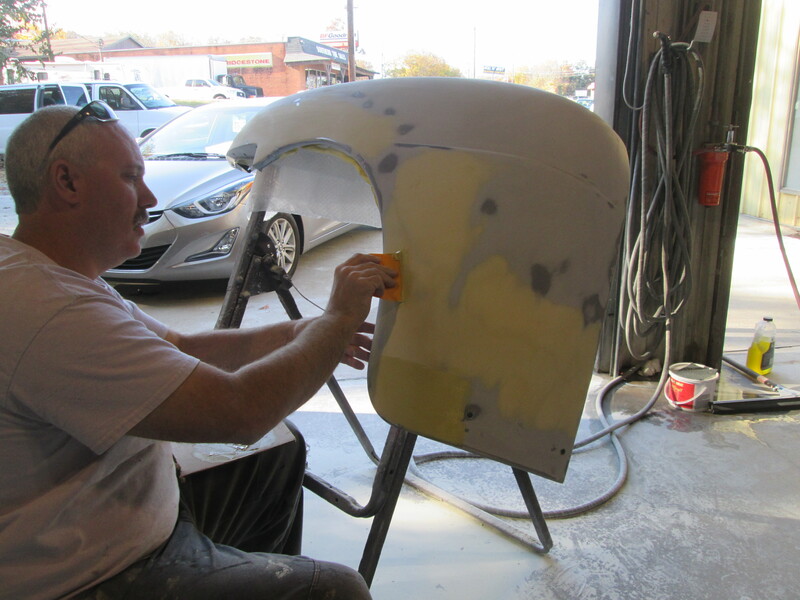 We spent a good portion of the afternoon blocking out some body panels and a little body work. 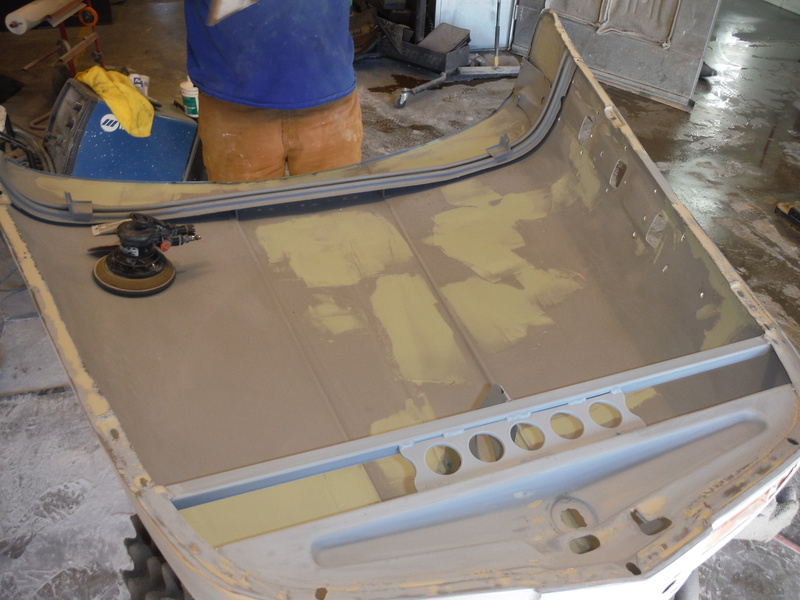 If you remember this car was stripped, epoxy primed and slick sand was also applied. 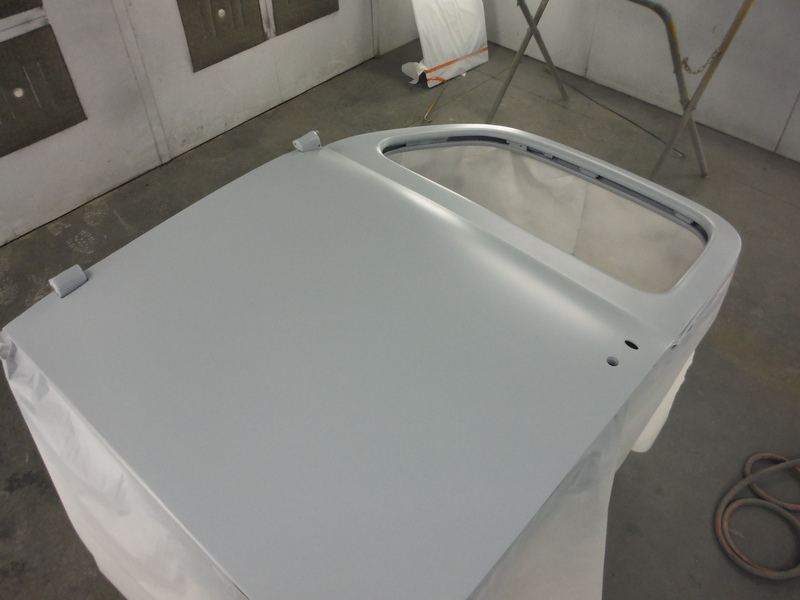 That is the grey product you see here. 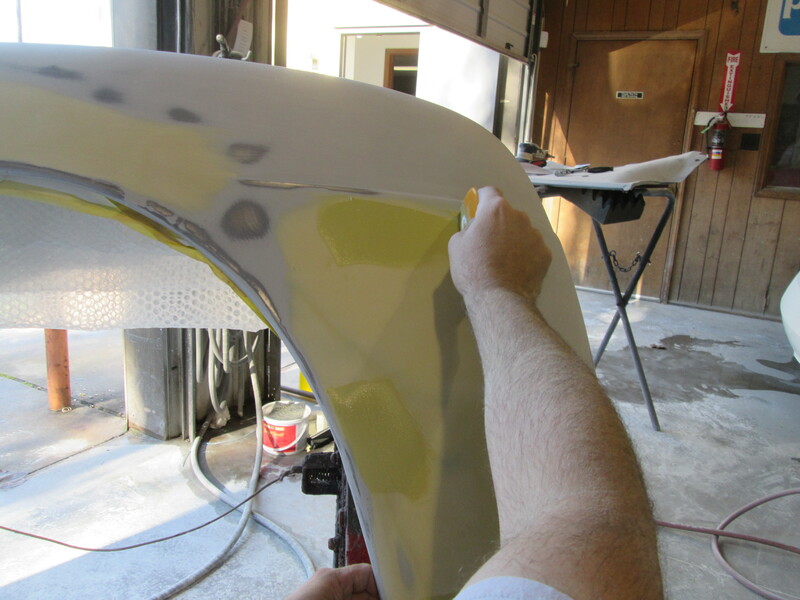 Its a very high building primer that allows us smooth out the waves and ripples to ensure a super straight end product. 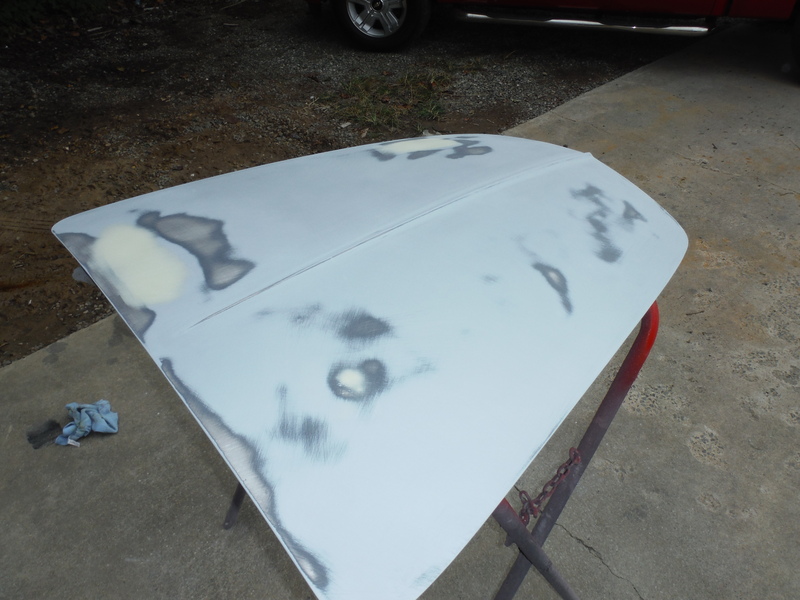 These panels were blocked with 80 grit on a long block. 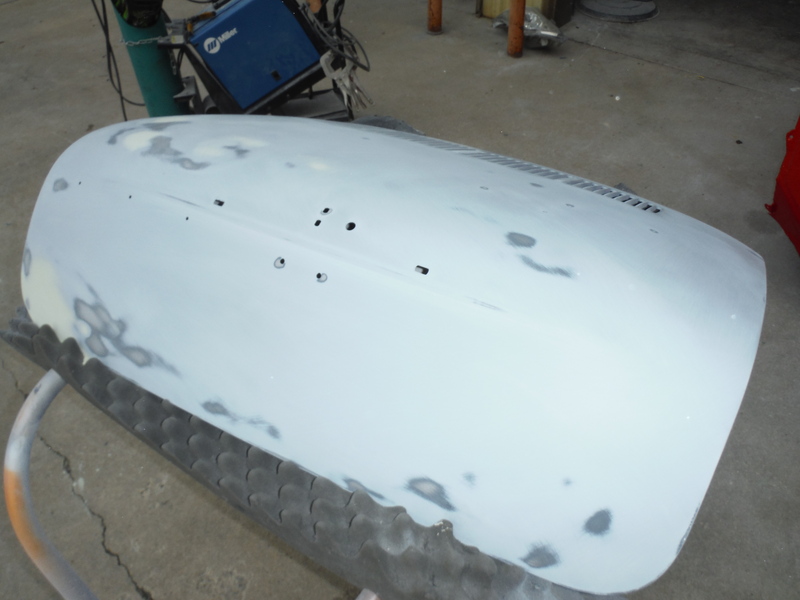 This showed us where the high and low spots were. 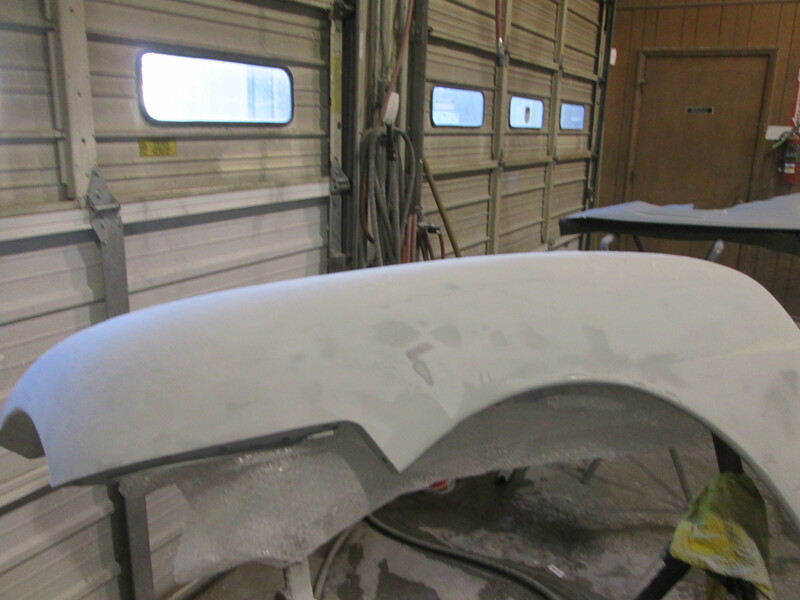 These were repaired and the hood and trunk lid are straight and ready for their final prime. 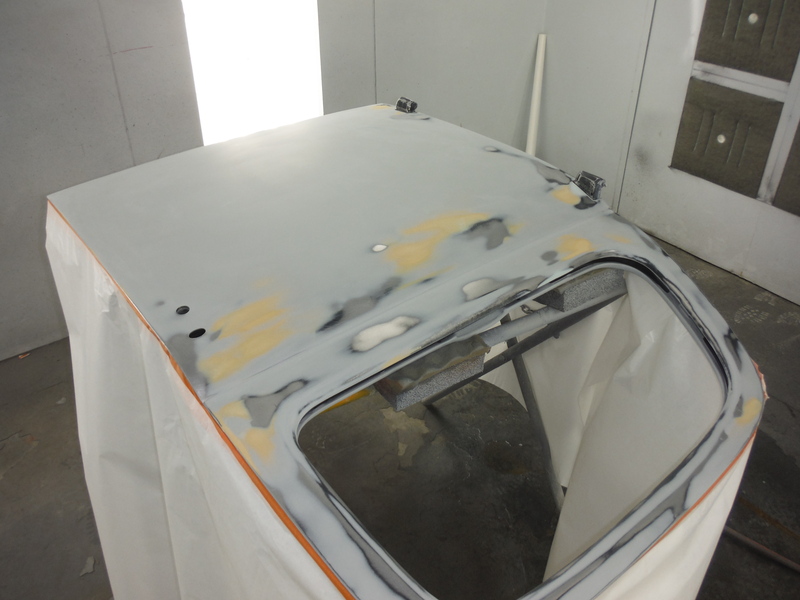 The roof was also blocked out but time ran out before we could finish up the body work. 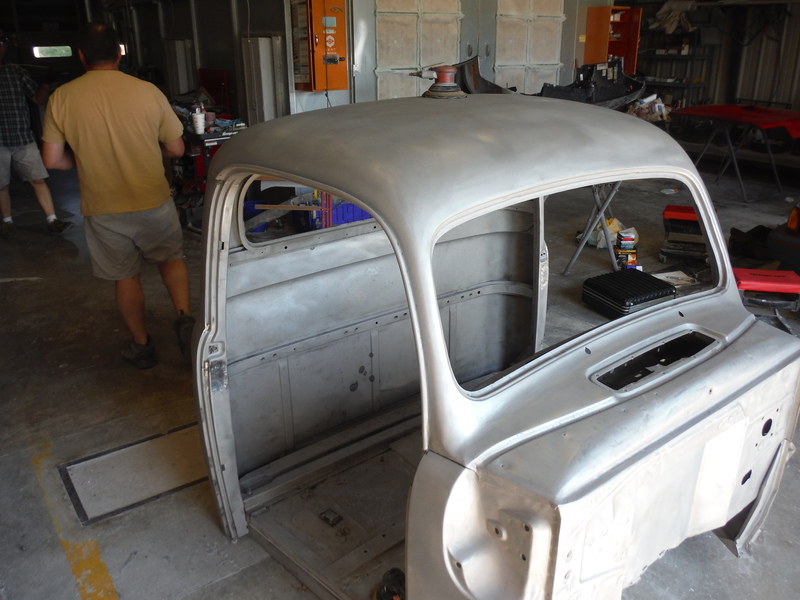 We still have some extensive rust repair to do on this car when the parts come in. 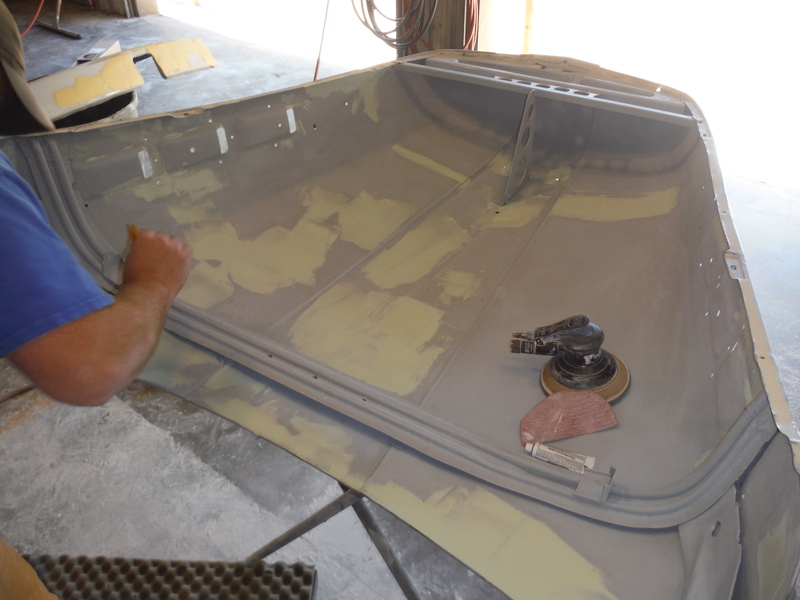 We should be getting on those repairs in the next week or so. 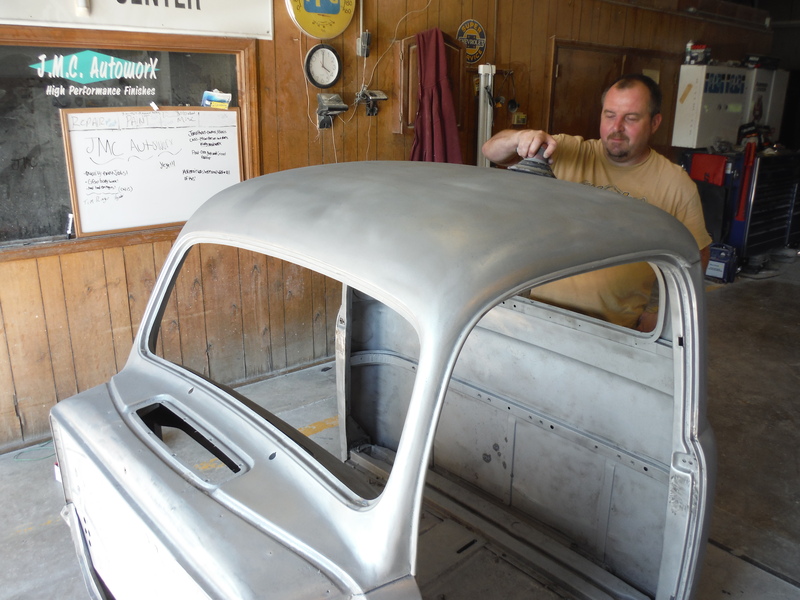 Work on the ’52 has been moving along this week. 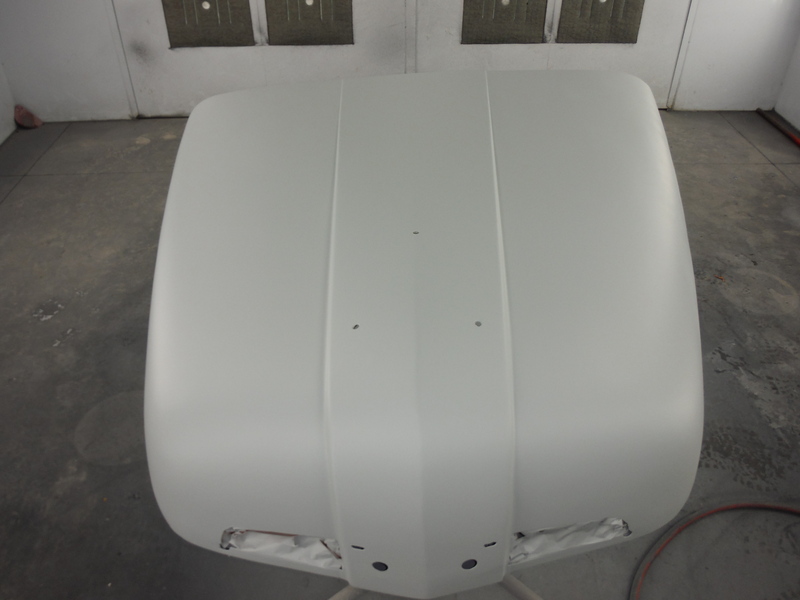 Last post on this showed it in slick sand primer. 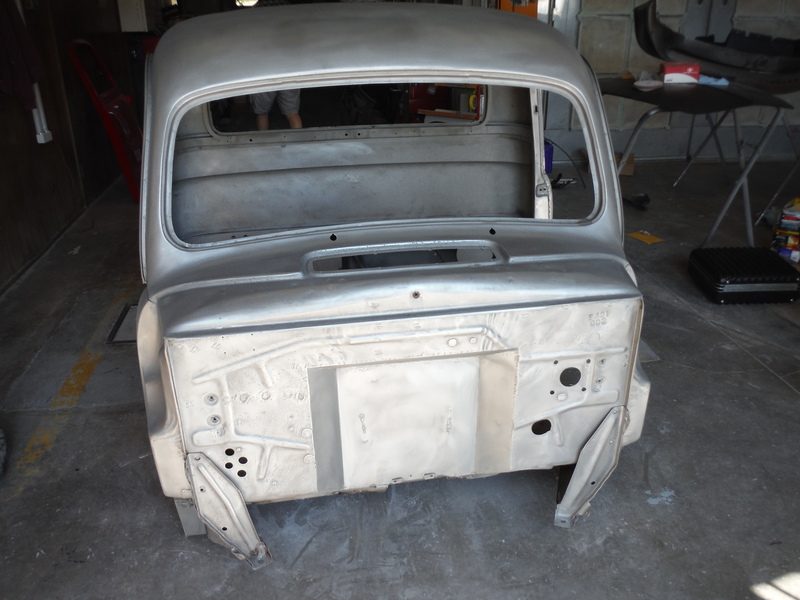 Well, all that has been blocked out and now its time for the final prime coat of urethane primer. 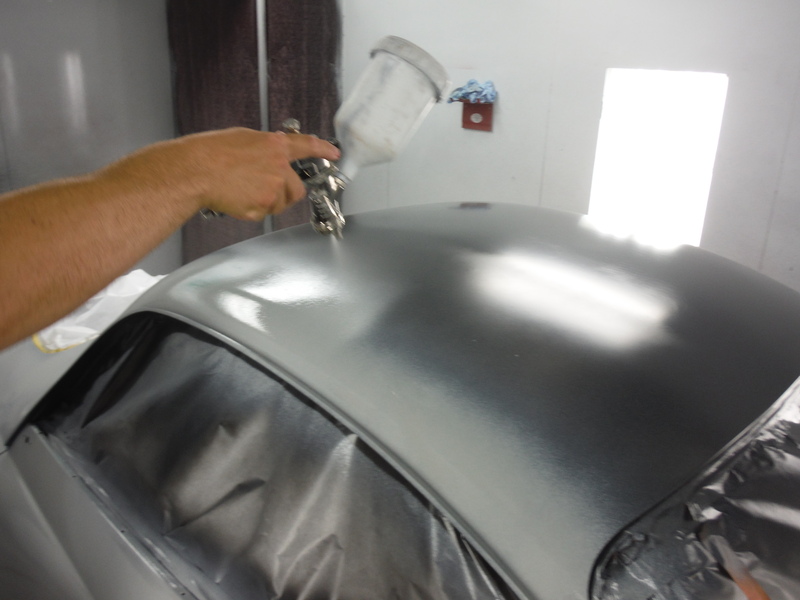 We will be applying about 3 coats of this primer and will block this out one more time. 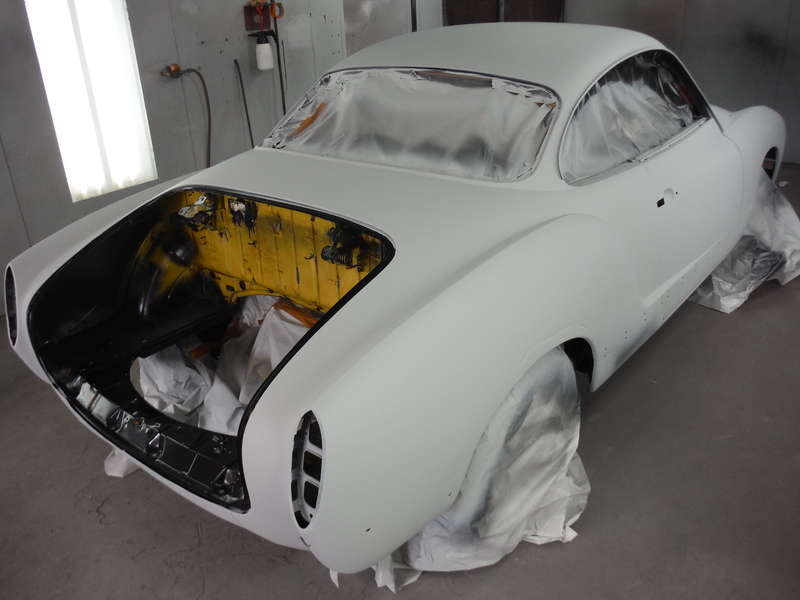 Once that step is complete it will be ready for color and clear. 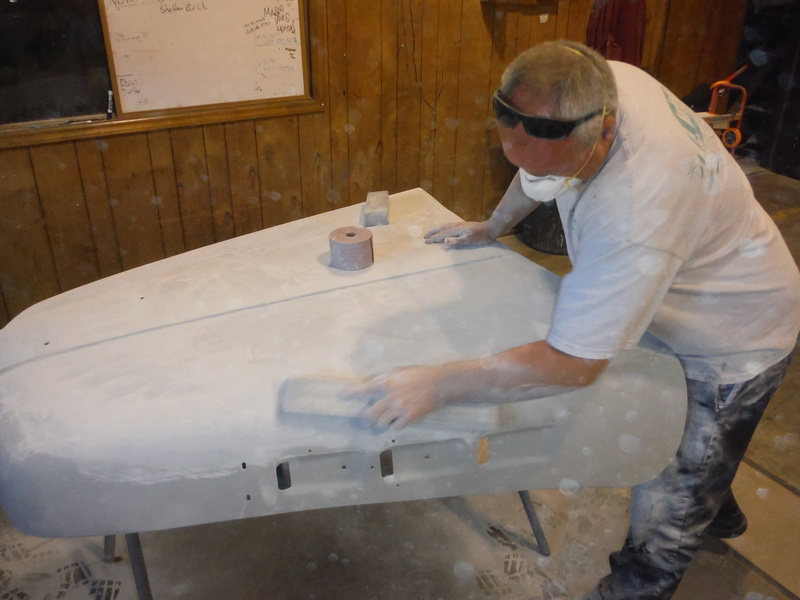 The slick sand was block sanded with 80 grit paper then sanded again with 180 grit paper. Our final block will be 320. 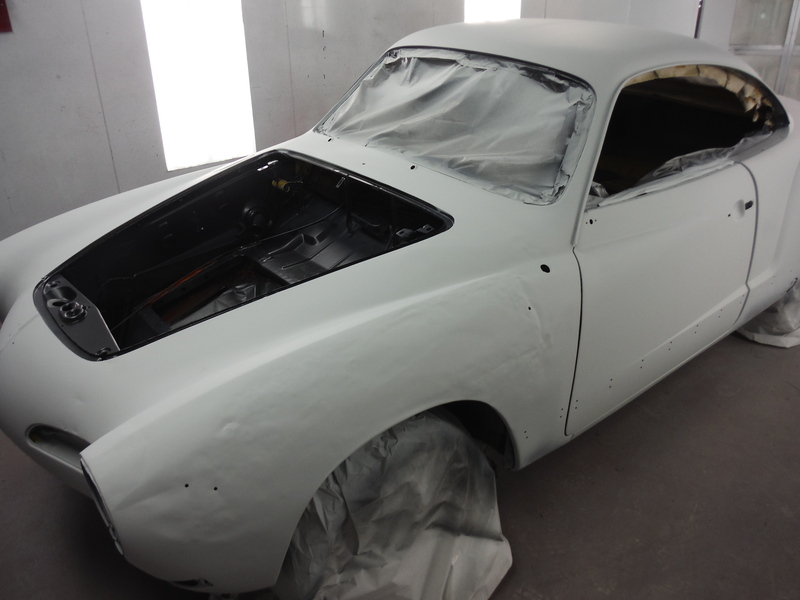 We will then go over it one final time with 600. 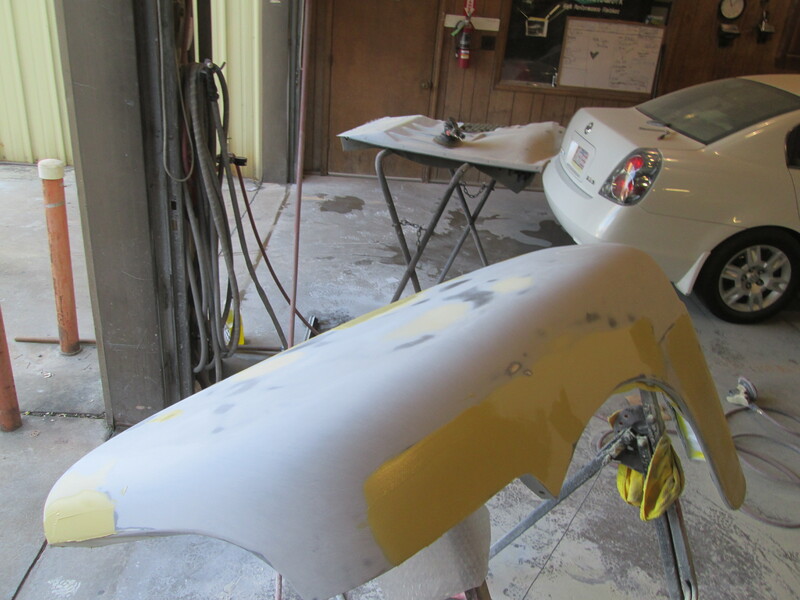 Paint will follow that step, hopefully next week. 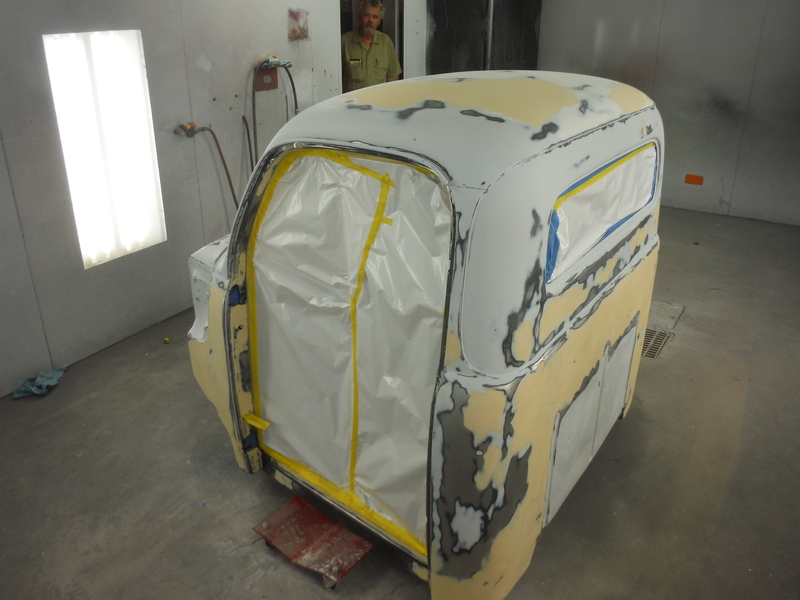 Stay tuned to see how this one turns out. 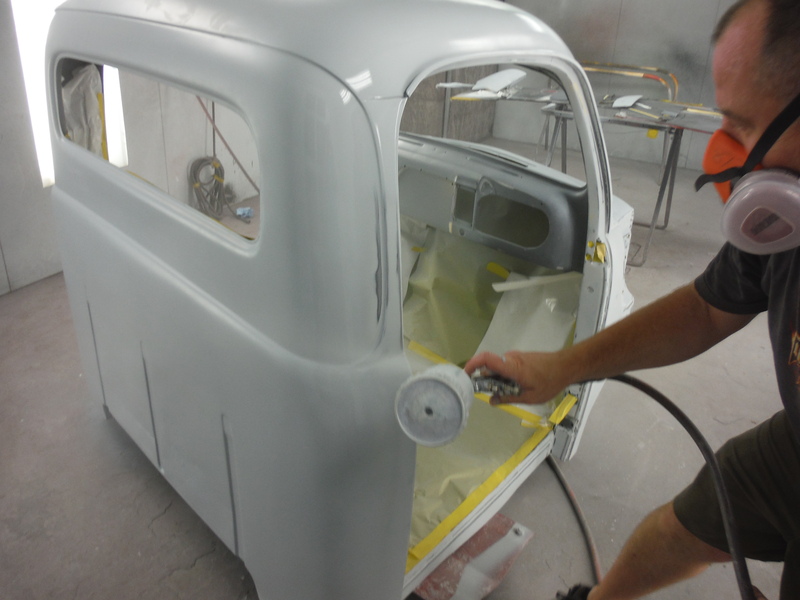 Today we were able to spend some time sanding on the cab to the ’52 Ford. 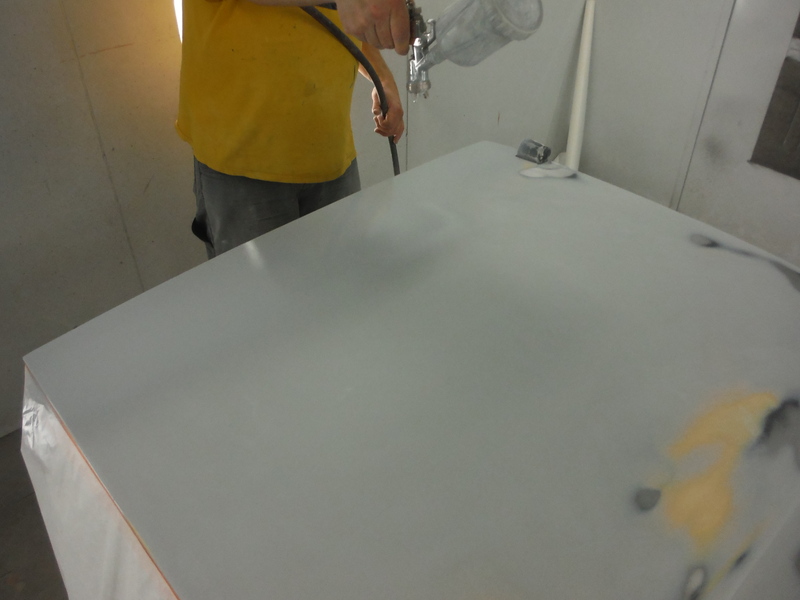 Just like all bare metal projects, we started with 80 grit on a dual action sander. 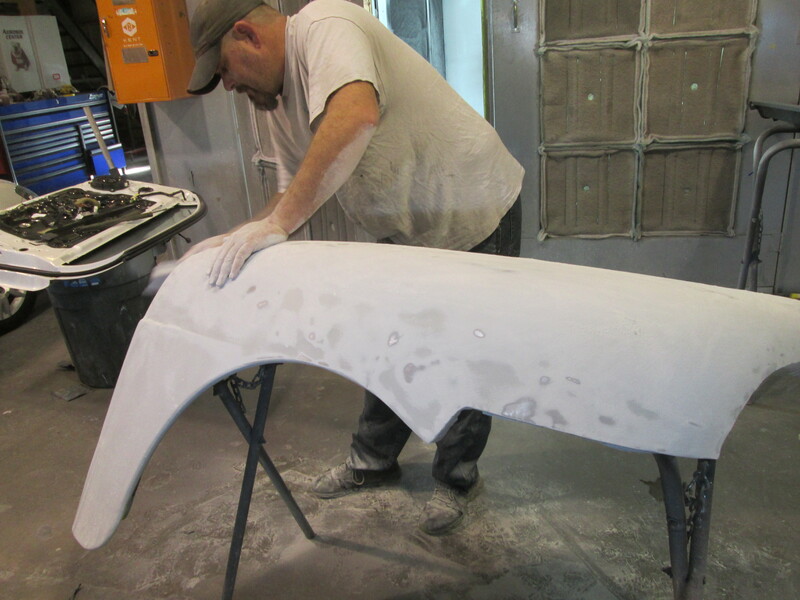 This smooths the metal and preps it for the epoxy primer that comes next. 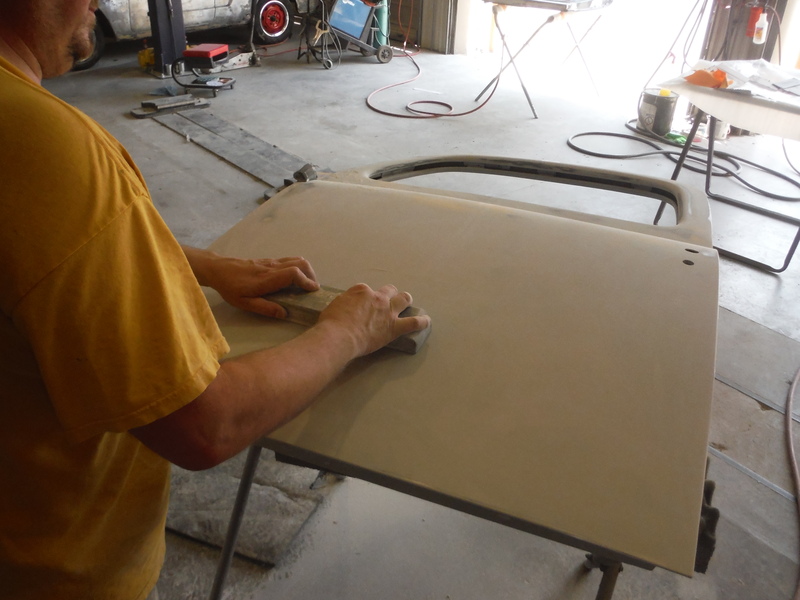 We got the outside pretty good, but sill have the inside to sand. 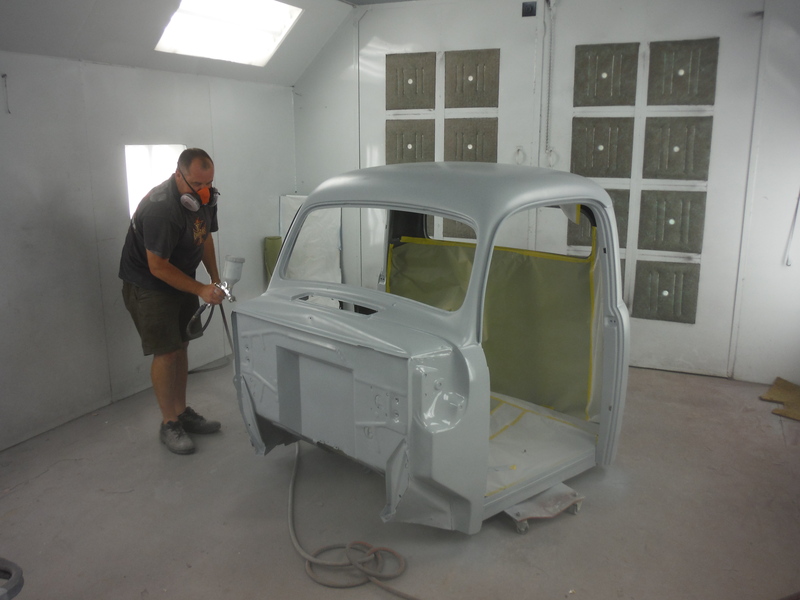 We hope to get that done tomorrow. 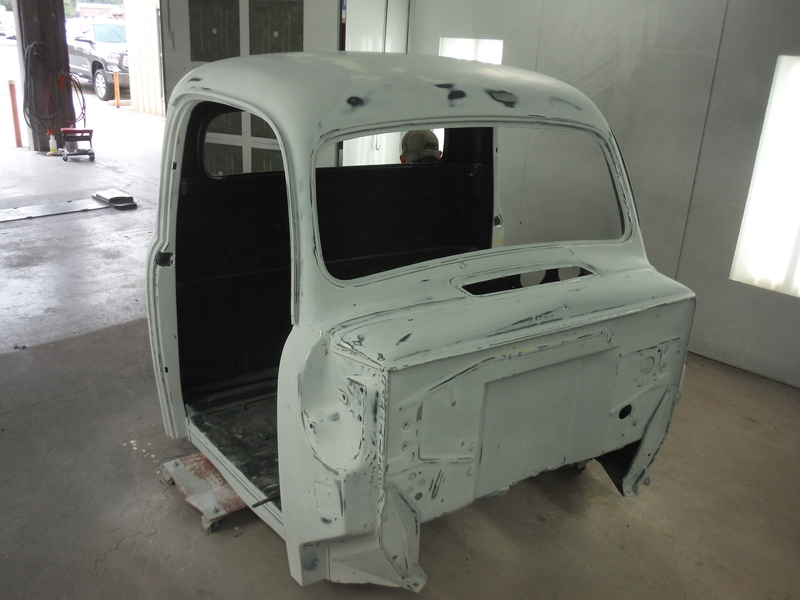 If it all works out, the bottom of the cab and the inside of the floor will have epoxy and our Raptor liner spray in bed liner sprayed on them by the end of the week. 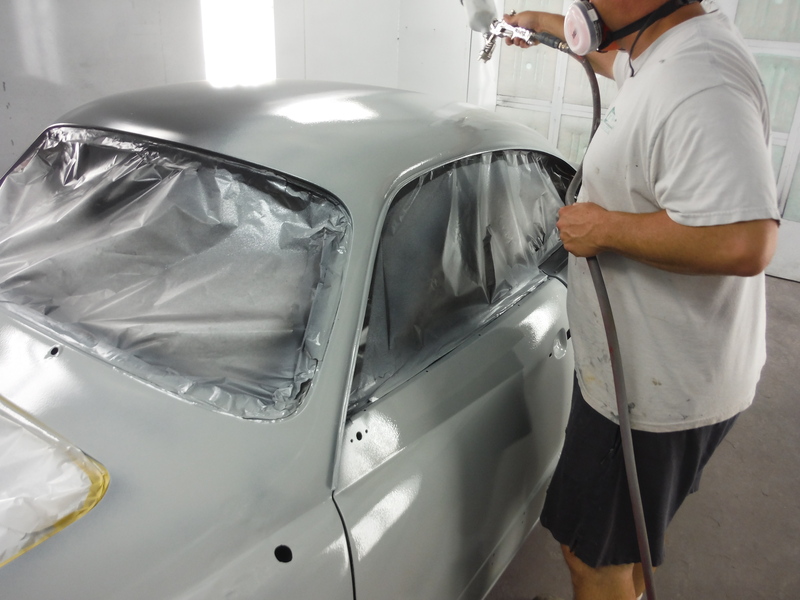 Today we were able to get the slick sand applied to the Ghia. 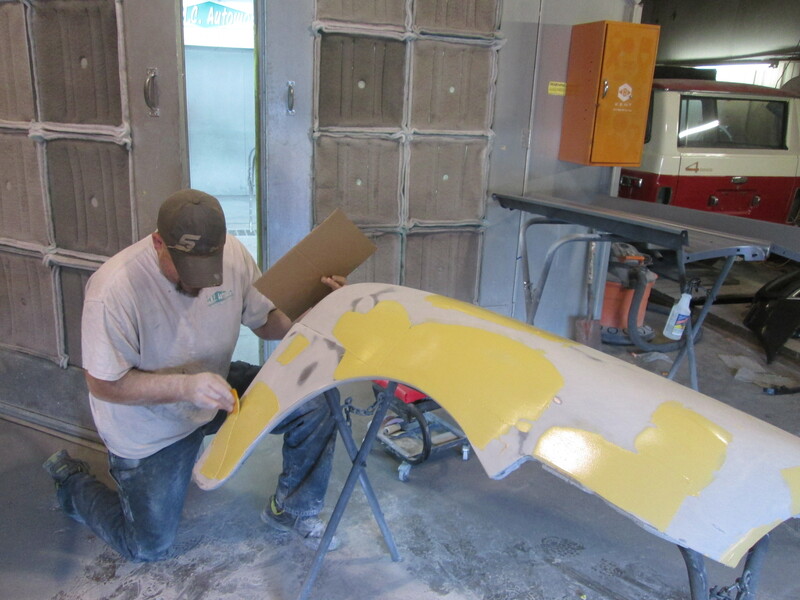 Slick Sand is a very high build primer that allows us to block out the fine waves and ripples in sheet metal. 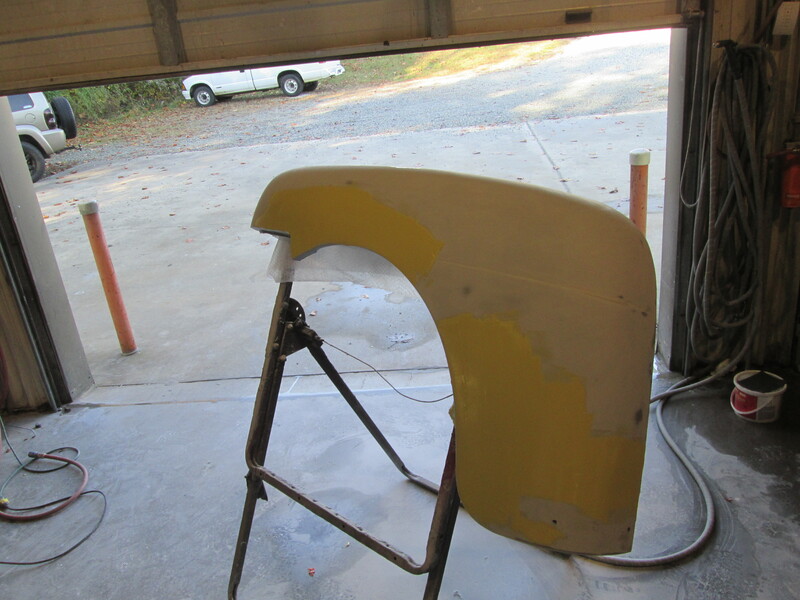 Once that was dry enough to move out of the booth, we put the hood and deck lid in the booth to spray the epoxy on them. 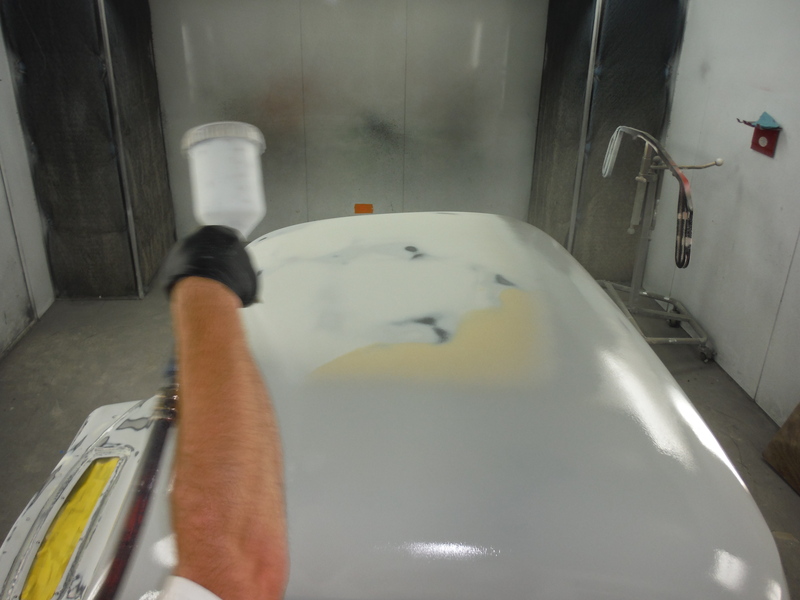 We sprayed the bottom side and then the top once it was dry enough to turn over. 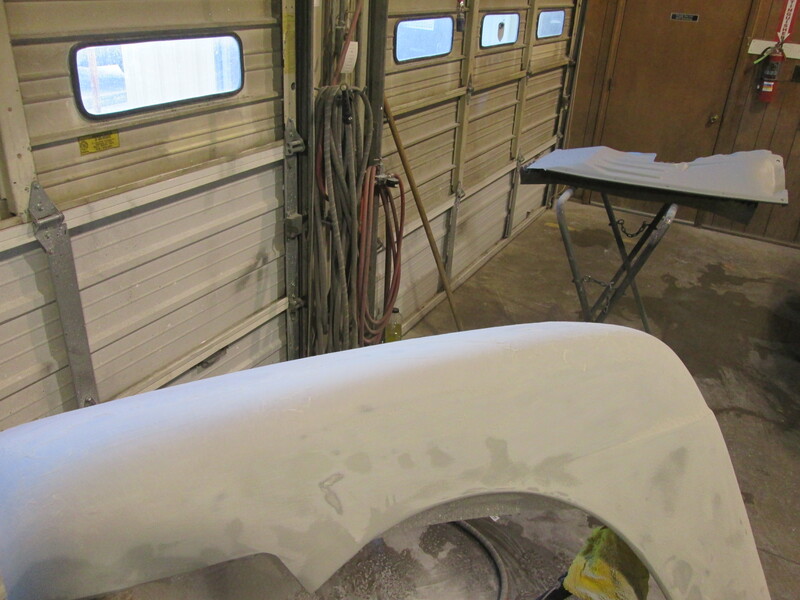 Monday we will apply the slick sand to these parts. 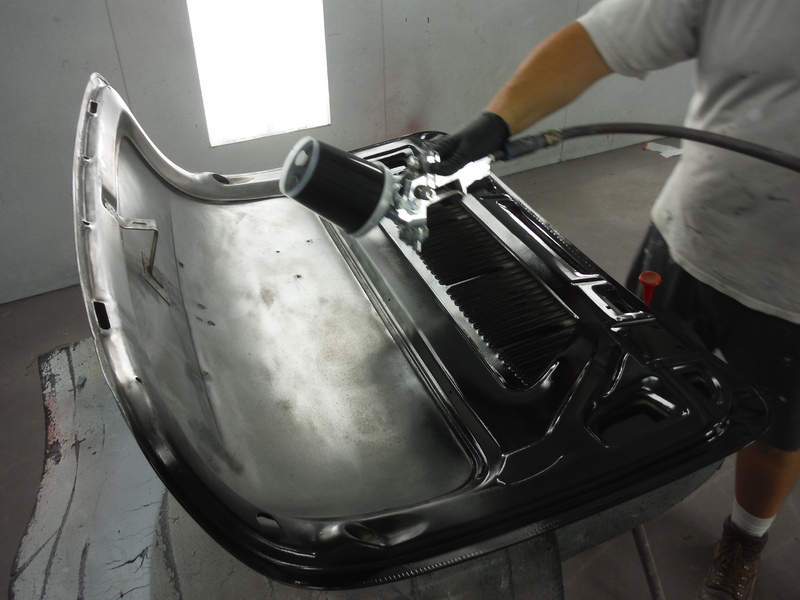 Now that the body is water tight with no worries about rusting from hand prints and humidity, we will start with the major rust repair in the rockers and floor pans. 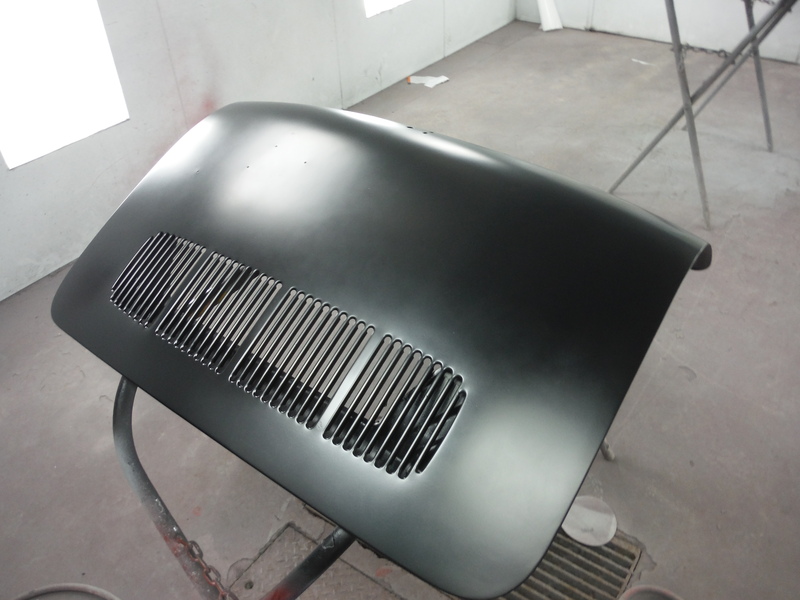 Great progress was made today on the hood for the ’52 Ford. 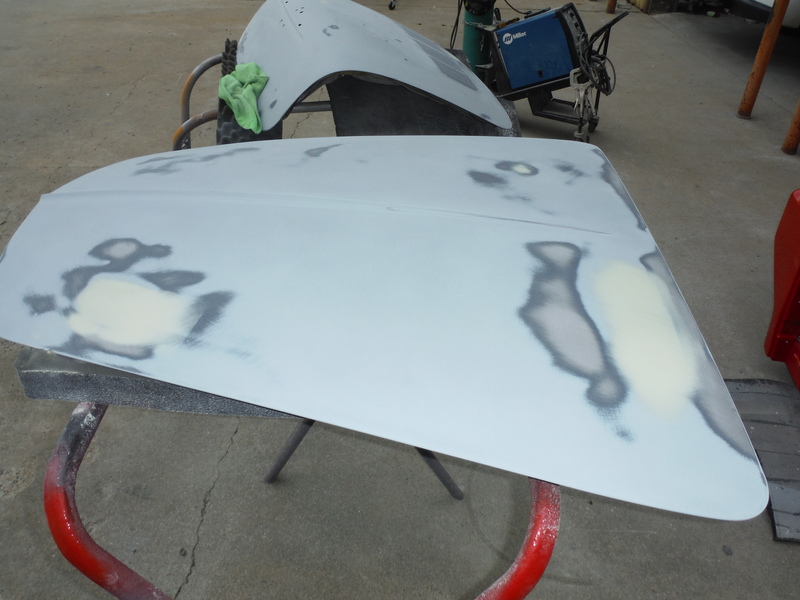 The slick sand was blocked out with 80 grit paper followed by smoothing those scratches out with 180 grit paper. 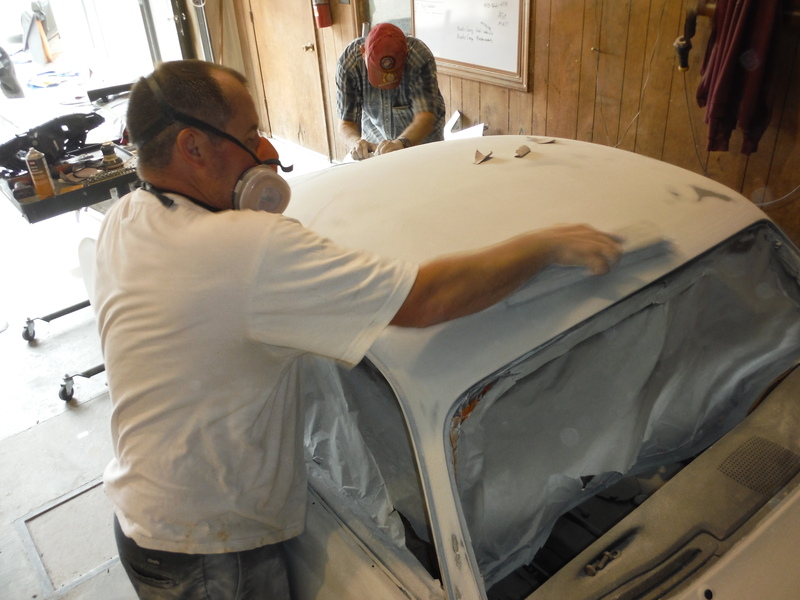 Once those blocking steps were complete, Chris took over and worked the bottom side of the hood. 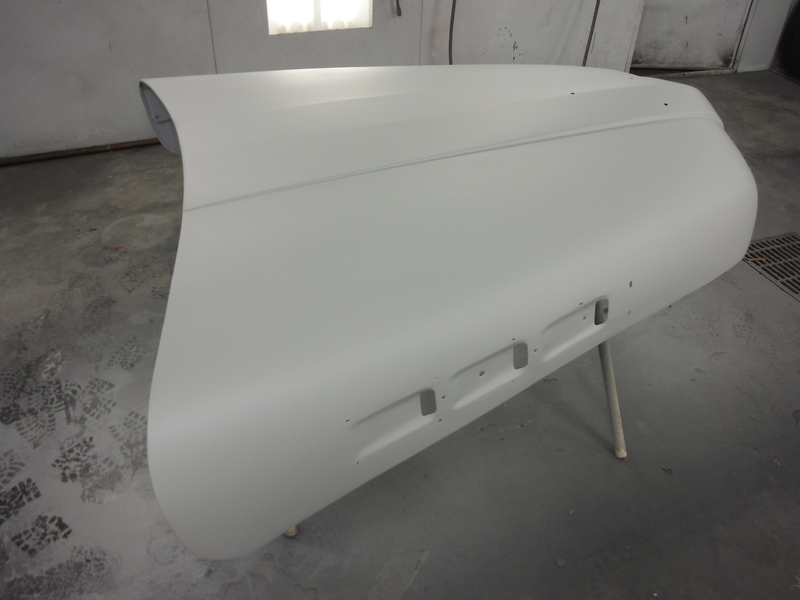 Since the bottom of the hood will be painted as nice as the top, we spent some time today making sure the body work on the bottom side looks nice as well. 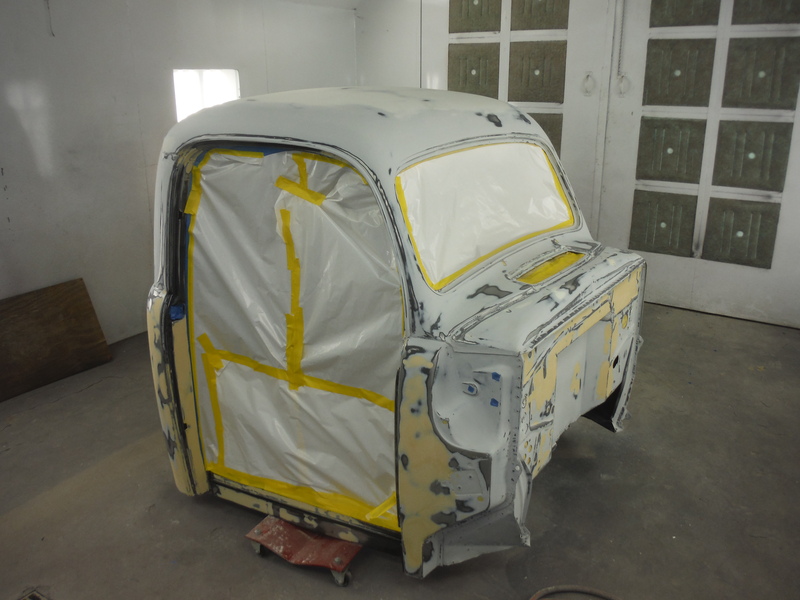 Tomorrow we hope to spray the final coats of primer and block it all out one final time before painting. 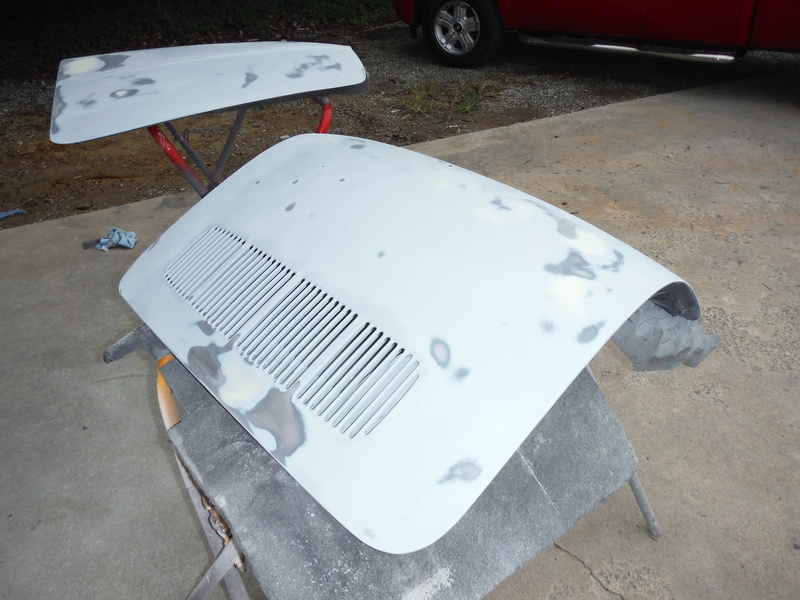 The hood on the ’52 received a few coats of slick sand today. 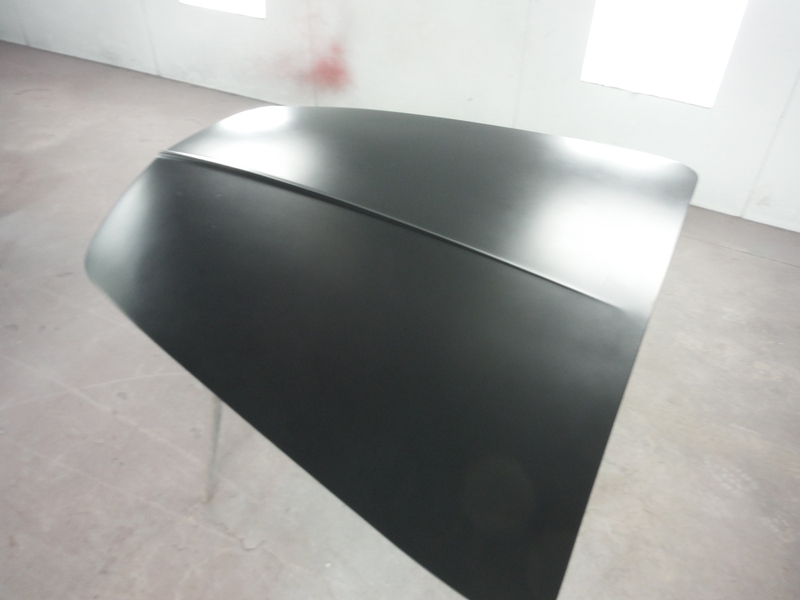 We have been working on the body work on this hood for the past few weeks. 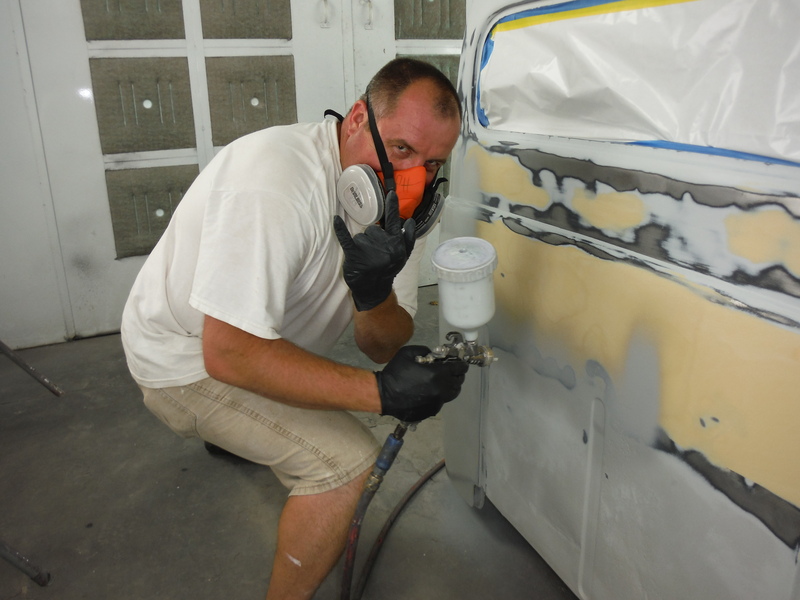 This truck has been used as a truck over its life and it has the battle scars to prove it. 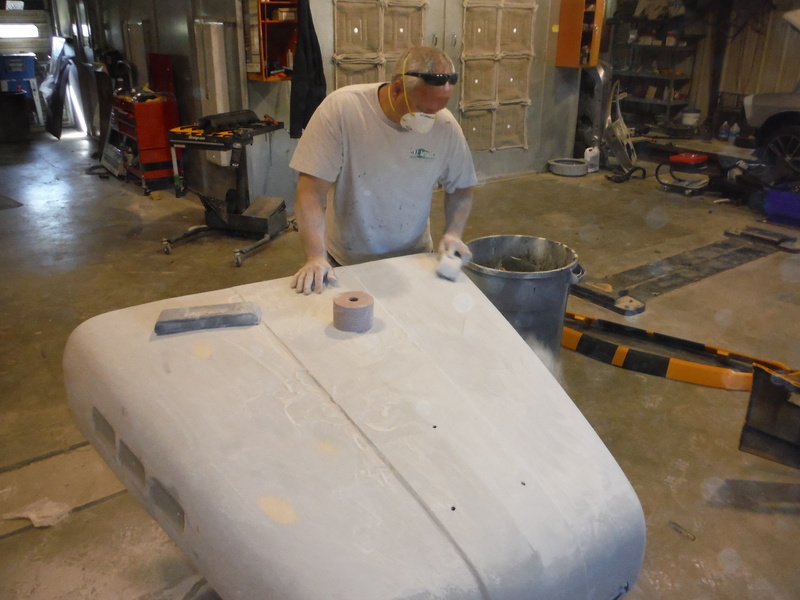 We got the body work really close and decided to put on a few coats of the super high build primer to get a few more layers to block out. 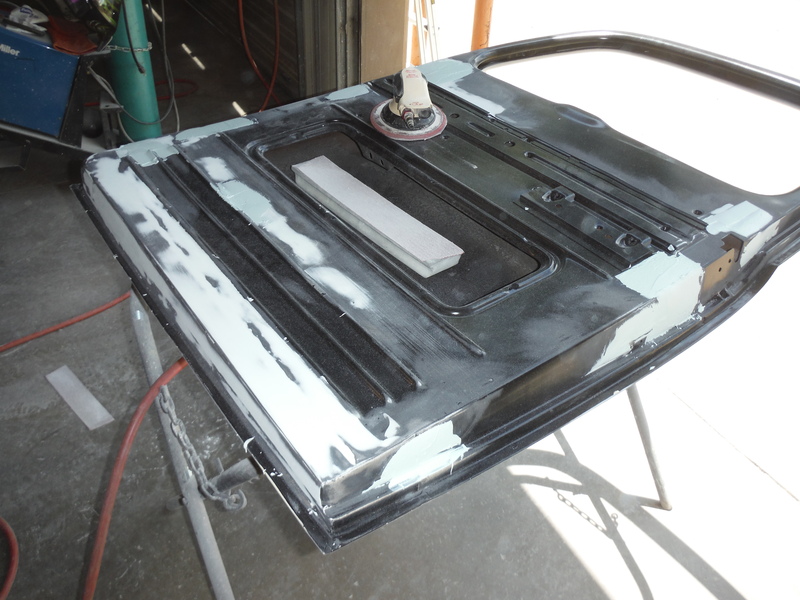 If that turns out well, we will prime it once more with PPG’s urethane primer. 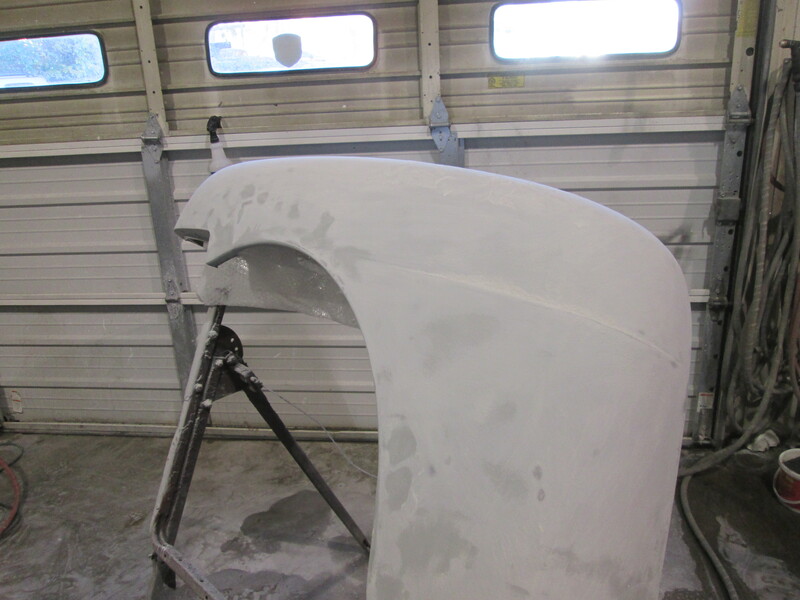 That will then be blocked again and before its painted. 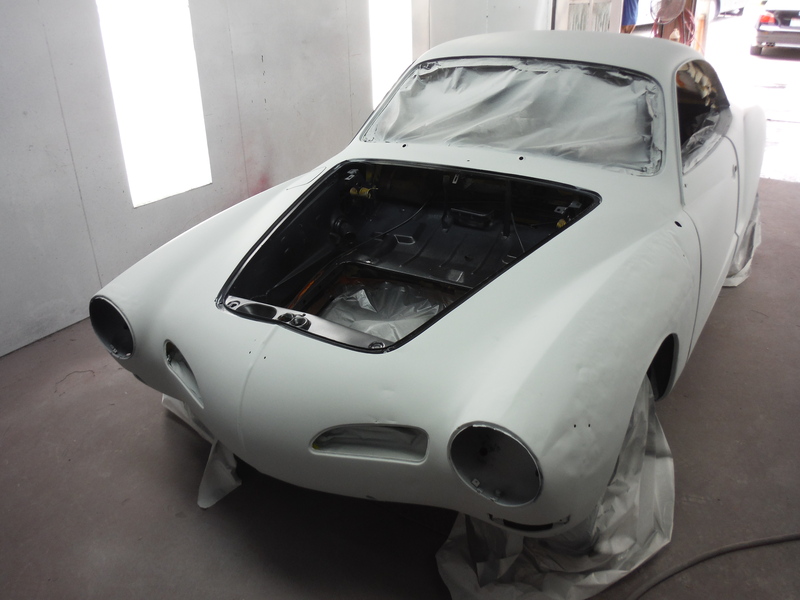 Good to see this one moving along again.